Hotels in Samode can be defined as ideal luxury incarnated in living. Hoels in Samode means a fantastic living in the luxury heritage hotels in India's most unique and remote settings. 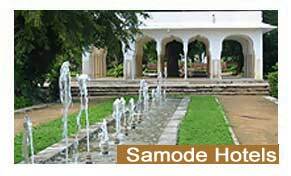 The Samode Hotels are hotels run by royal family members of contemporary period. They opt to offer you a personalized service and attention which begins with a welcome warm. Hotels in Samode let the guests experience India's rich history and majesty in a newer way. The most famous of the hotels of Samode are Samode Palace, and Samode Bagh. Samode, situated in Rajasthan lies at a distance of 42 km away from Jaipur. Being located on way to Shekhawati, this small village is famous for its havelis and forts. Samode is connected to Jaipur through a good network of roads. Samode is a perfect desert getaway. During the day, a camel ride through the Samode village and the surrounding countryside is a good idea. Riding this gentle animal with its rocking gait is the best way to relax on a sunny morning. A real visit to Samode cannot be considered complete without a musical evening of folk dances and songs. Rajasthani bards and musicians with their colorful dresses and unusual musical instruments provide one of the best evenings one can have in India. The instruments include one-stringed fiddles, country violins, bagpipes made out of goatskin, castanets, Jew's harps, and even a one stringed instrument made out of a dried gourd. The villagers sing with plaintive abandon under the faint light of the crystal stars. A musical evening can be arranged at a short notice at the Samode Palace.